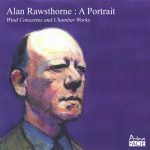 Andrew Mayes discusses the alternative endings to Alan Rawsthorne’s Concerto for Clarinet and String Orchestra, available on Alan Rawsthorne: A Portrait (PFCD053). Rawsthorne’s manuscript score of the Concerto for Clarinet and String Orchestra, dated January 1937, is held in the archives at the Royal Northern College of Music in Manchester. The first performance was given at a Lamare Concert in London’s Mercury Theatre on 22nd February 1937 in which the soloist was the dedicatee, Frederick Thurston, and the orchestra conducted by Iris Lamare. This was, incidentally, exactly one week after the first performance of the recently rediscovered Chamber Cantata for mezzo soprano, string quartet and harpsichord. These consecutive premieres must have been of considerable encouragement to the young composer who was soon to gain greater recognition following the first performances of his Theme and Variations for Two Violins and The Symphonic Studies for orchestra during the following two years. For all that it is a relatively early composition there is ample evidence of Rawsthorne’s very personal harmonic language and inventiveness of form that characterise his mature works. The first of its four movements is headed ‘Preludio’ and has the tempo indication Moderato. The clarinet’s wistful opening melody infuses the atmosphere of the entire movement, and even after moments of increased intensity, the close is quiet and refined on unison strings. ‘Capriccio’ is the heading of the second movement, marked Allegro molto. It is mostly lean and energetic, but its momentum is interrupted by the silence of several short general pauses, and a more brooding episode with divided strings that recalls the mood of the opening movement. The emotional heart of the work is the adagio third movement ‘Aria’. The clarinet’s expressive song, initially above divided cellos and pizzicato basses, seems later to be almost overwhelmed by two impassioned outbursts for the strings alone. It is eventually taken up, equally expressively, first by a solo violin and then a solo cello just before the close on the lower strings in unison. In the final movement, entitled ‘Invention’ and marked Allegro giocoso, textures are especially light. It opens with a dialogue between clarinet and second violins, and instrumental conversations abound. A brief quickening in tempo at the clarinet’s final restatement of the opening theme leads to an expectant pause before the closing flourish over F major string chords. In addition to the manuscript score held in the RNCM archives, there is a set of parts and a single page of manuscript score, RNCM ms.092, containing a revised and extended ending. This is not in Rawsthorne’s hand, but possibly compiled by a copyist from the parts. Written at the top is “Rawsthorne Clarinet Concerto – Revised ending now rejected by the composer 1963” below which are eleven bars beginning at bar 158 of the final movement. The musical notes on the string staves are in ink, but those on the clarinet stave are in pencil and reproduce the original ending, which occupies only the first four bars, the remainder of the stave is left empty. A note at the foot of the page reads “Position of clarinet part doubtful.” Another separate note reads, “There is some doubt, even by the composer, whether 11 bars were cut or not”. In John C Dressler’s Alan Rawsthorne: A Bio-Bibliography he comments; “However, this appears to be the ending used in the recording by Thea King.” The recording in question was made in 1981 and for which, rather than using the original published ending, Thea King and the conductor Alan Francis reconstructed the revised ending from a private recording of a performance by Frederick Thurston, conducted by Rawsthorne himself. Intriguingly, the string parts in the King/Francis reconstruction differ significantly from those in manuscript ms.092. John McCabe, when discussing versions of the ending in his book Alan Rawsthorne: Portrait of a Composer, commented “It is rather a pity that the decidedly weaker ending was the one to be published, or that performers are not provided with a choice between the two.” This choice has, however, been provided for the listener, and in addition to the original ending (of which this is believed to be the first recording), we have included our own transcription of the King/Francis reconstruction. In the process of making this decision we consulted Dr Philip Lane, who is well acquainted with Rawsthorne’s music, having transcribed a number of his film scores, and he concurred with our reading. We considered that not only must we respect the integrity the King/Francis reconstruction (it is the only source of the clarinet part for the revised ending), but also recognise that it has the authority of a version at least directly associated with the composer himself.